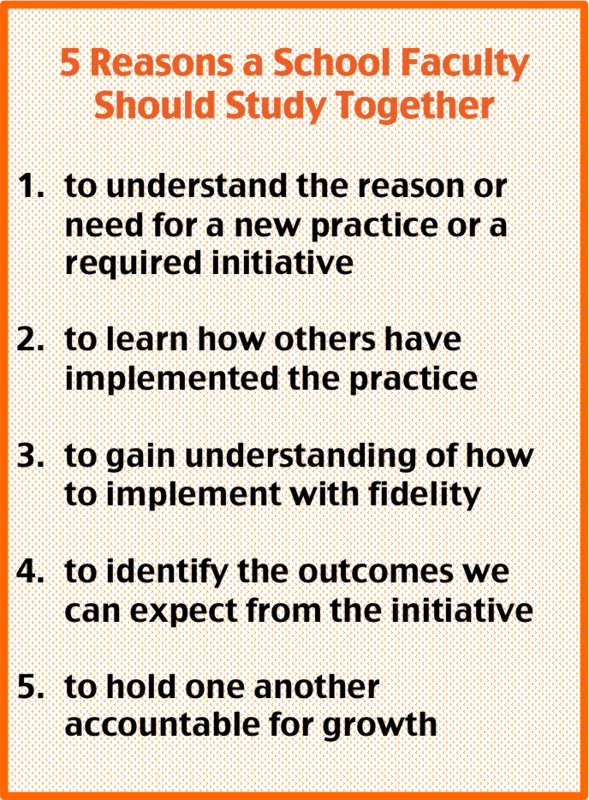 If a school leader wants teachers and support staff to adopt a new initiative or to embed a proven practice in any meaningful way, the best way to start is to study together. When we try to take short cuts to improving instruction or school-wide policies, we end up with lots of people acting like they are complying but with no significant change in practice. When I was teaching, I would have been highly frustrated by a leader's insistence on jumping through a hoop to satisfy a mandated practice, so I try to make sure that any implementation requirement for my teachers is grounded in a convincing rationale for helping kids learn. Whenever possible, my leadership team finds an article or a book chapter, sometimes an entire book, that addresses the need for the initiative or required practice. 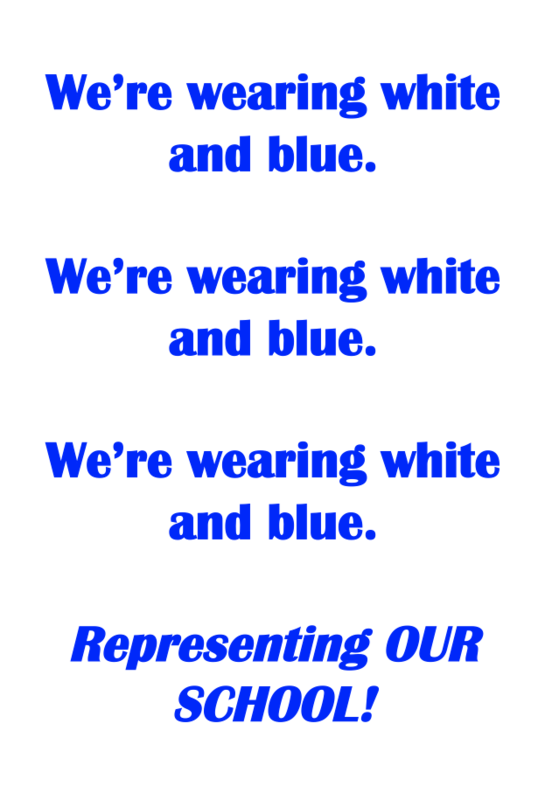 As the leader of a high-needs school in the poorest section of our district, I realized that my faculty and staff were divided on issues related to race and economic class. Most of us acknowledged that we needed to engage in dialog about conflicting perceptions and disparate experiences, but that didn't mean it was comfortable. Reading and discussing a book makes a difficult topic a little less personal, although we all made plenty of personal connections while studying Jawanza Kunjufu's Black Students, Middle Class Teachers. As our immigrant population grew, we had to learn to support and teach students who did not know English. 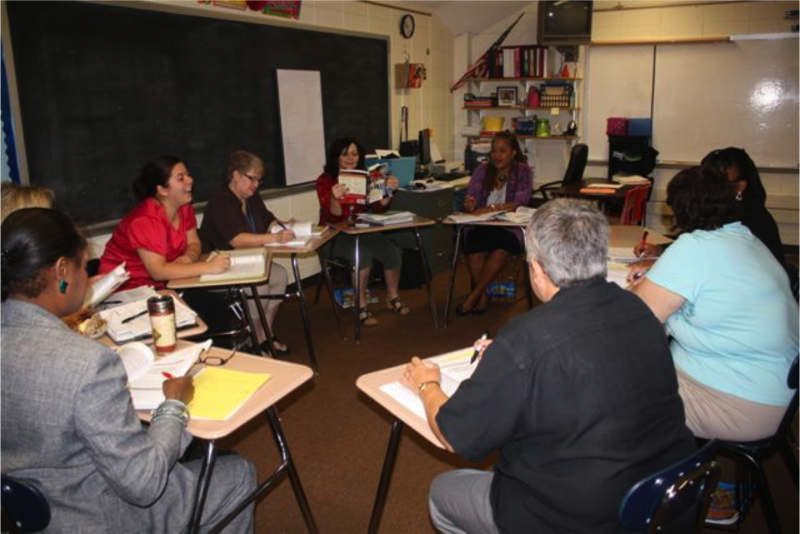 We spent our weekly inservice sessions in study groups, facilitated by a college professor and a district professional developer. We read, wrote about, and discussed the text, Culturally and Linguistically Diverse Learners. We practiced components of the Sheltered Observation Protocol (SIOP) presented in the book, an approach that teaches planning and delivery techniques that best serve ESL (and all) students. In the second school I led, my faculty and leadership read Rick Wormeli's book on Summarization and, more recently, Mike Schmoker's book called Focus. As individual classroom teachers began implementing the strategies we studied, we asked them to share their thought process and experience in our inservice times, including the effect of their practice on student learning. When their peers saw what these teachers were accomplishing with our shared student population, they were more motivated to experiment and share about their own attempts to improve instructional practices. Studying together almost always results in self-directed motivation to grow and change in our practice, and that brings energy and enthusiasm to our professional interactions. A few years ago, our grade level teams spent one team planning time per week reading and discussing Doug Lemov's extraordinarily helpful book Teach Like a Champion. One teacher on each team facilitated the study. This book provides specific, brief descriptions of highly effective techniques for managing the classroom and for engaging all learners. Every technique is presented with a one- or two-minute video of a real teacher demonstrating the technique in a real classroom. At the end of each meeting, the team members planned to practice the technique, reflect on their practice, and share with one another at their next meeting. Here's a sample of the technique called "100 Percent." One of my veteran teachers exclaimed, "Every new teacher should have a copy of The First Days of School and Teach Like a Champion!" Today was one of those memorable, affirming days at school. Students who are passing all classes with C's or higher assembled in our multi-purpose room (the gym) for our third- quarter recognition rally. The event began with the ubiquitous acknowledgement of all nine "Houses" and opening cheers as House captains marched in with each House's "family crest" on a banner. Mr. Brame, Theater/Debate/Creative Writing teacher and permanent Master of Ceremonies (not to mention District Teacher of the Year 2012-13), welcomed everyone to our Third Quarter Renaissance Rally and delivered the mic to members of our Equity Committee. This month is Asian/Pacific Islander Heritage Month. The Equity Committee introduced a visitor from Japan who educated us all on what it is like to live and go to school in her country. Our students were fascinated, and they rewarded "Ms. Erica" with an enthusiastic round of applause and an Arrowhead t-shirt. Next, a half dozen beautiful, somewhat shy, yet brave, Burmese students performed a traditional dance wearing gorgeous traditional clothing. 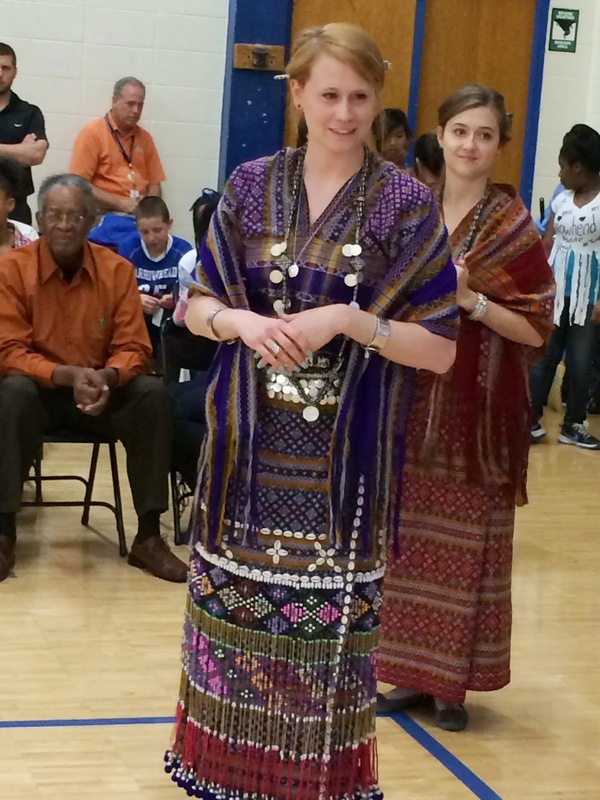 They also dressed two of their teachers in traditional garb and styled their hair according to Burmese culture. The girls' peers watched raptly and cheered their performance enthusiastically. 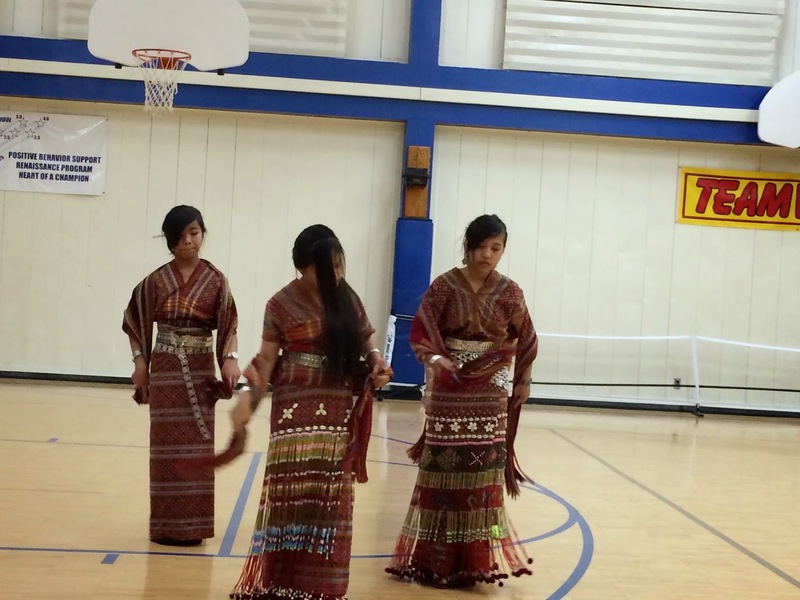 One of the girls then performed a popular Burmese song in her native language and further wowed the crowd. The teacher of our Life Skills class (functional special education program) presented a slide show of all the interaction she had filmed between regular education students who participated as "buddies" to her students in our new "Friendship Club." They obviously had a ton of fun and enjoyed getting to know one another. 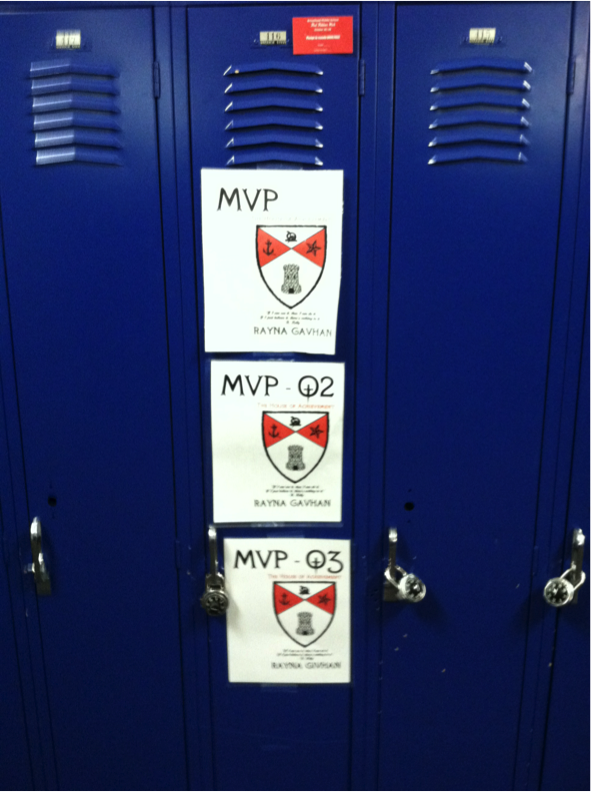 It was a moving presentation, made more special by how much the student body enjoyed and appreciated it. The Pep Club demonstrated the newest dance, the Nelly, and then invited audience members to join them on the floor for another run-through of the dance. A big group of kids and adults tried out the dance all together. A group of boys performed our newly minted "Arrowhead Rap" which was written and originally performed by our campus officer. Many of our students have learned every word over this school year, and we all love it! Coaches introduced the Spring sports teams. Teachers read off lists of students who earned each achievement level: Bronze (2.0 to 2.9 GPA), Silver (3.0 to 3.5 GPA), Gold (3.6 to 3.9 GPA) and Platinum (4.0+ GPA). Students stood when their names were read, and classmates cheered. The winners of the three heats then competed in the final round, a race in which House members stacked six snack cakes on the forehead of one member, who had to balance the cakes for three seconds. Then, the whole team had to wrap a rope around all four members, tuck an orange under each of their chins, and cross the finish line at half-court. 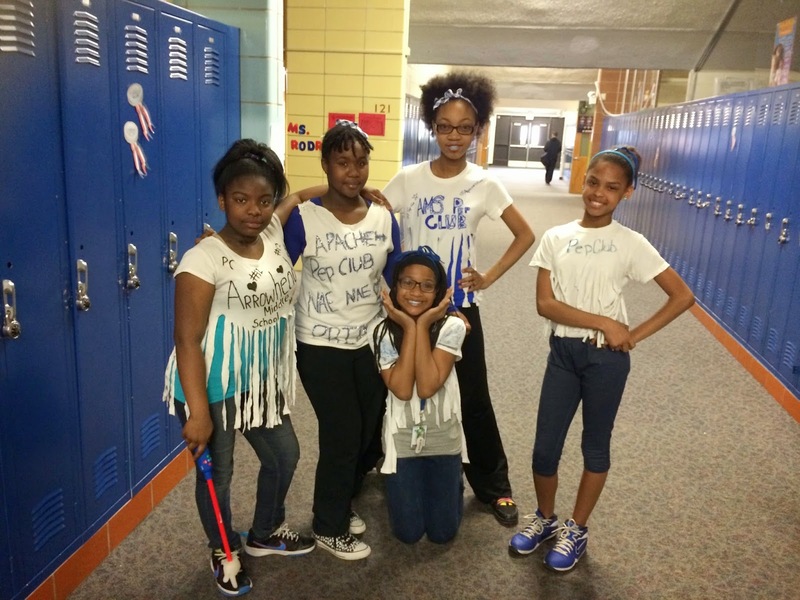 Our Renaissance committee (the group of staff members that creates each recognition rally) invited the fifth-graders, with their teachers, from each of our three feeder schools to come experience a rally and tour the school. They had a blast. Imagine receiving welcoming cheers from older middle schoolers just before you transition to the big time! I am SO PROUD of how my teachers and staff work together on so many projects throughout the school year to make sure our kids have fun, make a contribution, receive recognition, and have opportunities to shine. No wonder our young people respond so well to our programs. I love to see their joy in performing or trying something new, their efforts to excel in schoolwork and extra-curricular activities, and especially their acceptance of and kindness toward one another. I love how the young people and the adults in our building do not exhibit or experience an "us-vs.-them" relationship but rather a sense of family. Working hard to make sure every student feels a sense of belonging in our school is a major priority for us. Deliberately building inclusion and orchestrating fun is critical to create the climate we want. All discipline is punitive if school personnel do not balance rules and consequences with the message that we value and enjoy one another, our shared students, and our students' families. for many of the photos in this post. The office referral is an important communication tool between teachers and administrators. The administrators and teachers in our building have examined and revised nearly every facet of our discipline system over the eight years I have been principal in our urban middle school. In our attempts to improve the efficiency of our system, we decided to embed in the form some guidance for helping our staff respond to students' behaviors. One section of our referral is labeled COUNSELOR. Teachers discover students' relationship problems when one or more student tells them about their issues, or one or more student is crying, or students are arguing, or other peers report or complain about the problems the students' issues are causing. 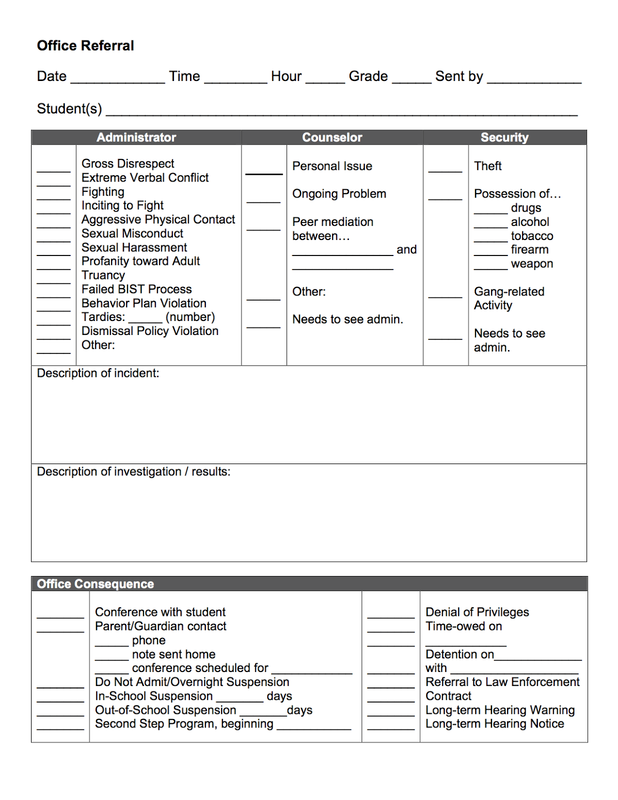 In order to protect the learning environment for the majority of students, we direct our teachers to send temporarily troubled students to the counselor, using this section of the referral. Our counselor listens and probes until she can discover the root of the students' problem and then tries to mediate the issue. 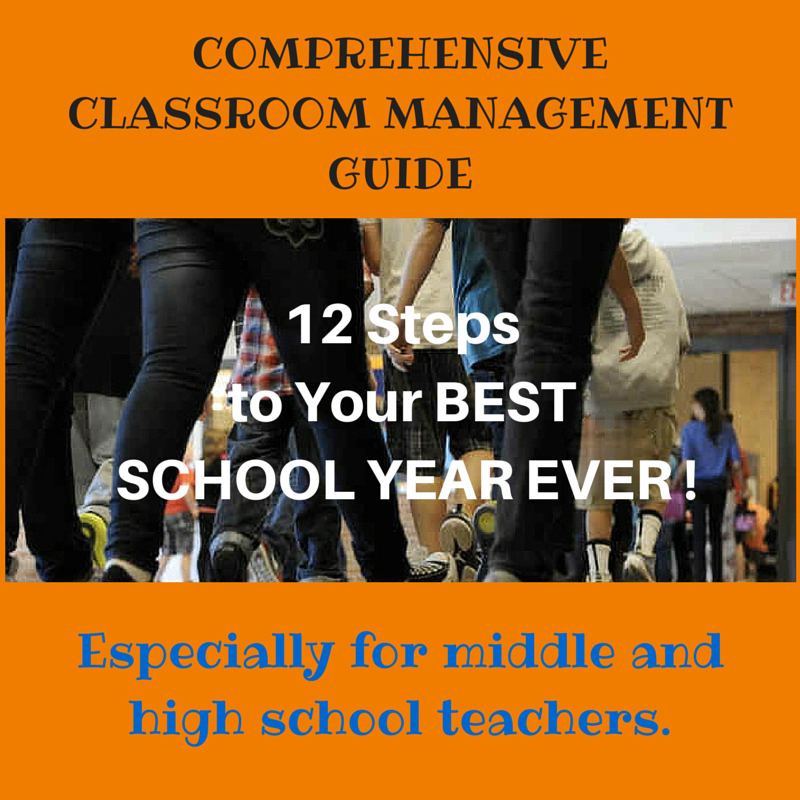 If appropriate, the counselor may arrange a peer mediation between feuding students. Peer mediators are students, selected by their peers, to be trained in how to help others understand one another and solve their problems. If the counselor discovers bullying or cannot convince students to let an issue go once it has been addressed, she may send students on to the assistant principal for more intervention and/or an office consequence. Another section of our referral is labeled SECURITY. Our campus officer investigates the following categories of incidents: Theft, Possession of a Controlled Substance, and Gang-related Activity. 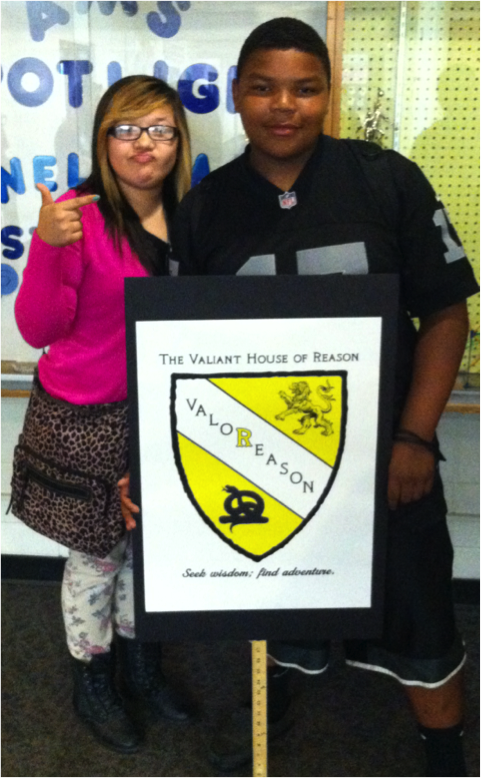 He is usually the first responder to an actual fight or any sort of attack as well (which is rare in our school). These acts are serious breaches of our social contract because they make students (and sometimes adults) feel unsafe. The officer questions all who may be involved and then reports his findings to the assistant principal. She may investigate further herself, and she determines an appropriate response to the student's behavior. The most-used section of the office referral is labeled ADMINISTRATOR. The district's Code of Conduct lists the kinds of infractions that occur in schools. These infractions are listed in this section of the referral, along with each infraction's code number so the administrator can easily enter accurate information in the disciplinary data base for our school. For all three sections of our referral - ADMINISTRATOR, COUNSELOR, SECURITY - there is a space for the referring adult to describe the incident and a space for the adult responder to describe the outcome of any investigation. The administrator or her secretary makes a copy of the completed referral for the student's file and returns the original to the teacher or referring adult, almost always the same day she gets the referral. Teachers need to know that something was done in response to their referral, and they need to know what action was taken. Students need to realize that administrators will back up teachers in their attempts to keep our building safe and productive. 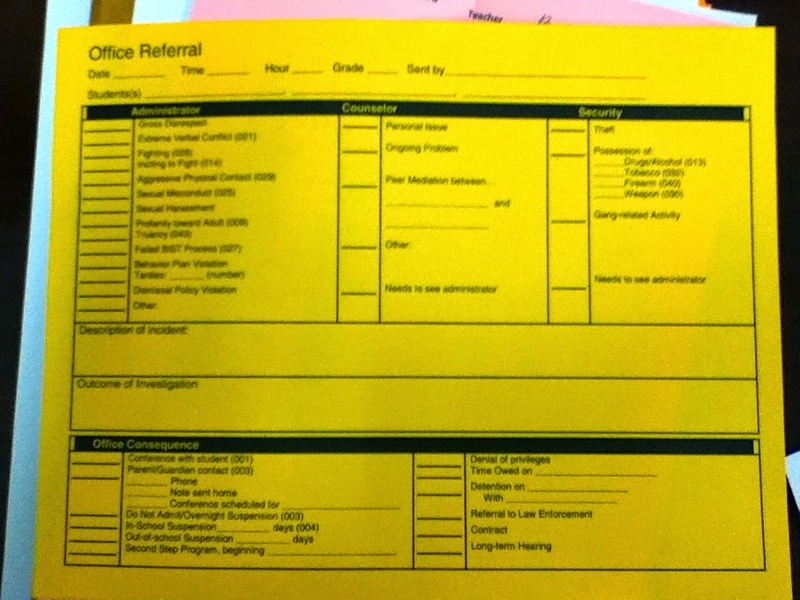 We print our office referrals on goldenrod copy paper. No other forms or materials are prepared on goldenrod. Everyone can recognize this paper as an office referral. Administrators can identify referrals from all other papers in their mailboxes or upon their desks. Secretaries can tell that a student is carrying a referral when they walk into the office. This is not to shame a student but to help adults respond in a timely way to disciplinary incidents.